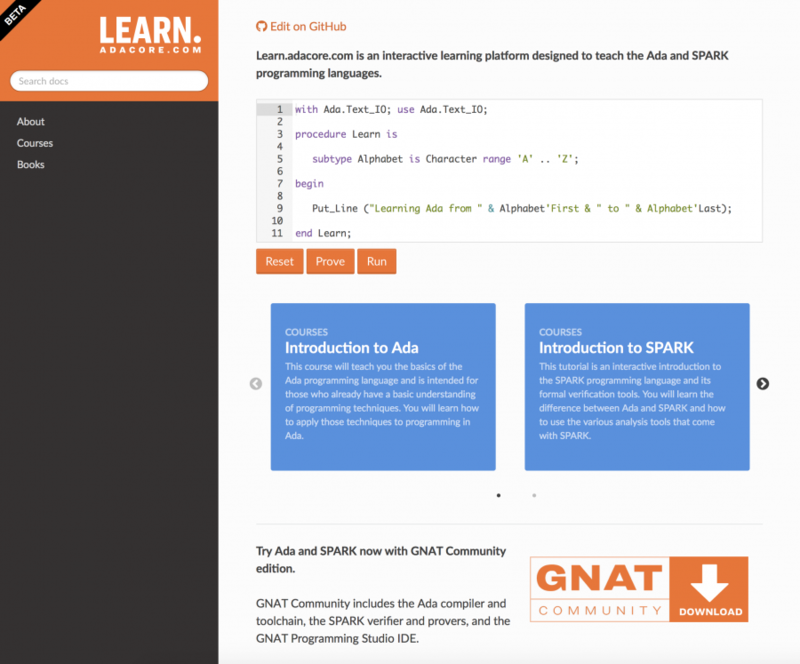 We are very proud to announce the availability of our new Ada and SPARK learning platform: learn.adacore.com. Following on from the AdaCoreU(niversity) e-learning platform, this website is the next step in AdaCore’s endeavour to provide a better online learning experience for the Ada and SPARK programming languages. This new website is designed for individuals who want to get up and running with Ada/SPARK, and also for teams or teachers looking for training or tutorial material based on Ada/SPARK. In designing the site, we decided to evolve from the video-based approach used for AdaCoreU and instead have created text-based, interactive content to ease the learning experience. In light of this, AdaCoreU will be decommissioned in the coming weeks but the course videos are already available on YouTube and the base material, including slides, remains available on GitHub for people who want to use it for their courses or trainings. The main benefit of a textual approach is the greater flexibility in how you advance through the course. Now you can easily pick and choose from the course material with the opportunity to move on to more advanced sections but then refer back to previous content when needed. We also provide greater interactivity through code snippets embedded in a widget that allows you to compile, run and even prove your code (in the case of SPARK) directly from your Web browser. This allows you to experiment with the tools without having to install them, and tweak the examples to gain a better understanding for what’s allowed and feasible. As for course content production, this new format also allows greater interactivity with the community. The source code for the courses are in reST (reStructuredText) format, which makes it easy to edit and collaborate. It’s also hosted on GitHub so that everyone can suggest fixes or ideas for new content. For the release of learn.adacore.com, you will find two courses, an introduction to Ada and an introduction to SPARK, as well as an ebook “Ada for the C++ or Java Developer”. In the future we plan to add advanced Ada and SPARK courses and also a dedicated course on embedded programming, so watch this space! Learn.adacore.com can also help you get started early and gain a competitive advantage ahead of this year’s Make with Ada competition. Emma Adby is the Marketing Operations Manager at AdaCore. Emma works globally on all operational tasks within the marketing department from organising events right through to public relations and design work. She enjoys helping people build software that matters through marketing communications and promotes safe and secure software development. Emma graduated from Sheffield Hallam University, UK before moving to Paris and joining AdaCore.